Stories of the Second World War Blitz in London describe the atmosphere of fear and destruction. Night after night, bombs fell, pulverising homes and threatening hope itself. No one knew how it would end; they didn’t even know what each night would bring. The call to “Keep Calm and Carry On” was fundamental—it aimed to bring out resourcefulness, courage and resolution in the face of adversity. Despair was debilitating and pointless, and between the bombs it was all too clear: life carried on and hope was never far away. There’s a reason that mantra continues today; it carries a lesson that applies across all aspects of life—mindset matters. That is certainly the case in the fight to save coral reefs. We can panic and despair—or, we can swallow hard, keep our heads and adopt a solution-minded resolve. We can get to work, calmly and quickly, to turn the situation around. We can still save coral reefs—but we must band together. As we learn more about the full value of coral reefs to people, it’s clear that strengthening them can no longer be only an environmentalist’s endeavor. It is also a critical human development strategy. 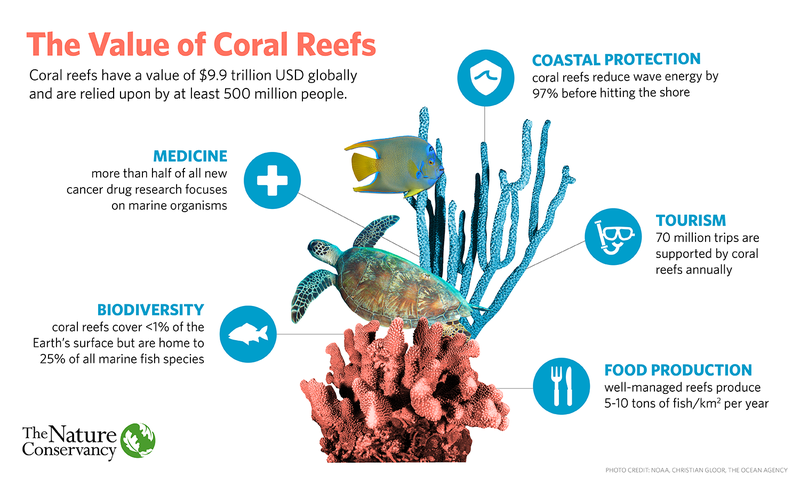 It’s why corals are part of the United Nation’s Sustainable Development Goals. It’s why the Mexican government partnered with the local tourism industry to set up a trust that protects its Mesoamerican reef and beaches. It’s why the insurance industry is looking to place policies on coral reefs and the tourism sector is waking up to its responsibility to fight for healthy reefs. And it’s why we’re even seeing impact investing and financial markets leveraged in places like the Seychelles to increase the resilience of both reefs and communities. Indeed, the value of coral reefs is uniting more people in the creation of new and innovative solutions. These new entrants in the fight give us hope. At the same time, emerging science shows not all corals are as fragile as we feared. In fact, recovering corals are sometimes stronger than their predecessors; we’ve also learned certain reefs have greater resilience, and some can survive even in more acidic waters.The value created by coral reefs is uniting more people in the creation of new and innovative solutions. So, while we can’t immediately dial down water temperatures or reduce acidification, we can learn from both the places where reefs are thriving and where they are struggling to better protect them from stressors. In the Caribbean, for example, revolutionary mapping technology—applied from space to sea— is being used to capture never-before-seen detail that enables smarter planning, better decision making and personalized solutions at a much faster pace. Coral reefs are not doomed. Just as cities the world over have bounced back from unspeakable aggressions, these bustling marine communities can recover, too. New corals can rapidly colonise the dead skeletons of their predecessors, and myriad fish and other creatures can return. This recovery is essential because, for millions of people, coral reefs are much more than bastions of wonder and exploration; they are life essential engineers of food and medicine, and stalwart protectors of people’s homes and livelihoods. So, in this 2018 International Year of the Reef, we must be optimistic—but we must do more than hope. We must call for governments, companies and organizations of all types to pull together towards a global, pragmatic, science-based and solutions-oriented approach to saving coral reefs. Much like the Blitz on London, global climate change brings great unknowns, but we believe that coral reefs are far from doomed, particularly if we rally our knowledge, resources and creativity. If, together, we keep calm and coral on. Mark Spalding, The Nature Conservancy, full article here.